Online menswear retailer Mr Porter has teamed up with streetwear brand Off-White to launch an exclusive capsule collection available only on its site. 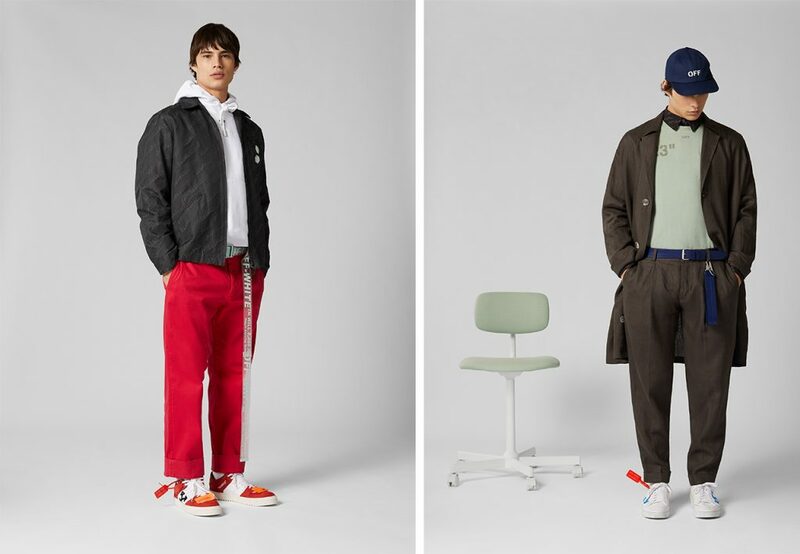 Beginning Monday, January 21, Mr Porter will debut a 44-piece collection titled “Modern Office”, a revisionist dress code of traditional and modern sportswear, inspired by a new generation of workers and their work places. Under the direction of founder Virgil Abloh, the exclusive capsule collection has been created with Off-White’s leading maxim – to define the grey areas between black and white as the color off-white – and interprets the collection’s overarching themes of flux, evolution and modernity into a synergy of fabrics (wool, felt, cotton and heavy canvas), colors (muted and tonal), treatment (clean and distressed) and visuals (graphic and non-graphic). The collection, which retails between $60 and $1,440, is comprised of 20 ready-to-wear pieces, 18 accessories, and 6 pairs of footwear. Standout pieces include: the work trench linen coat with tonal embroidered arrow logo; all-over logo-print washed cotton heavy canvas jacket; wide-leg linen trousers with tonal arrow logo; all-over logo silk camp-collar shirt; “Modern Office” logo print jersey T-shirt; all-over logo jersey T-shirt; “Class of 2013” logo print cotton T-shirt; low-top 3.0 leather sneakers; distressed CO sneakers; all-over logo suede leather sneakers; all-over leather pool slide; Cordura canvas hip-belt; “Class of 2013” iPhone X cover; industrial logo rubber and leather belts. To celebrate the partnership, Mr Porter will launch a social-first integrated global marketing and content campaign, culminating in a Mr Porter X Off-White feature story in the January 24 edition of The Journal. Mr Porter will also activate the launch off-line in a collaborative workspace in Seoul, South Korea, inspired by the capsule collection’s “Modern Office” aesthetics, from January 14 – 20.